A restored Roman cockerel figurine is the best result from a Cirencester dig in decades, archaeologists have said. 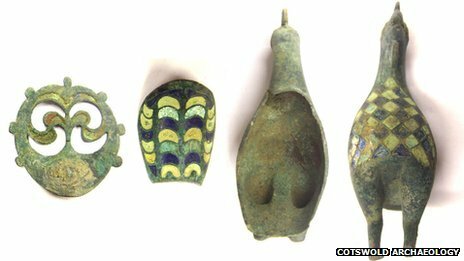 The enamelled object, which dates back as far as AD100, was unearthed during a dig in 2011 at a Roman burial site in the town. It has now returned from conservation work and finders Cotswold Archaeology said it "looks absolutely fantastic". The 12.5cm bronze figure was discovered inside a child's grave and is thought to have been a message to the gods. It is believed that the Romans gave religious significance to the cockerel which was known to be connected with Mercury. Experts say it was Mercury, a messenger to the gods, that was also responsible for conducting newly-deceased souls to the afterlife. The figurine had to be sent away for conservation work to be carried out which has taken four months to complete. Archaeologist Neil Holbrook, from Cotswold Archaeology, said the work had "exceeded expectations", particularly for highlighting its fine enamel detail. "It reinforces what a fantastic article this is and how highly prized and expensive it must have been," he said. "This must have cost, in current money, thousands of pounds to buy and countless hours to make, and so to actually put this into the grave of a two or three-year-old child is not something that you would do lightly. "It really shows that this was a very wealthy, important family, and signifies the love that the parents had for the dead child." 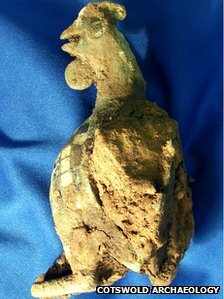 The cockerel was found during excavation work at the former Bridges Garage site on Tetbury Road in Cirencester - once the second largest town in Roman Britain. A burial site was unearthed at the site including more than 40 burials and four cremations; something experts said was the largest archaeological find in the town since the 1970s. This particular figurine is one of only four ever found in Britain, with a total of eight known from the whole of the Roman Empire. 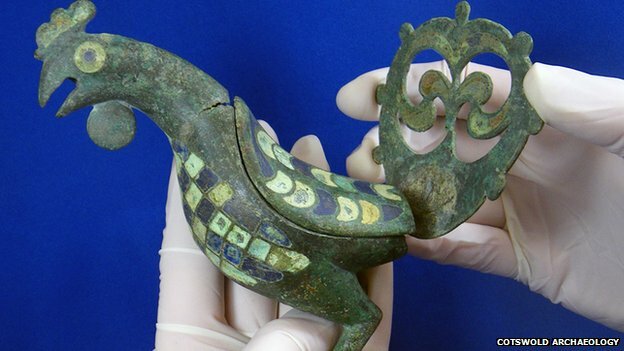 Mr Holbrook added: "Without a doubt this is the best Roman cockerel ever found in Britain. "This is the best find that I have seen come out of Cirencester in 30 to 40 years and is of national significance." The object is believed to have been made in northern Britain, with evidence pointing to a workshop in Castleford, West Yorkshire, which made enamel artefacts. Talks are under way for a permanent display of the cockerel, possibly at the Corinium Museum in Cirencester.